EWB-USA CCNY Spring 2017 Alumni Newsletter is here! Welcome to our third ever semi-annual Alumni Newsletter! So much has happened within the last few months, ranging from a very successful Wine & Cheese Social to the start of our new Domestic Project to our attendance of the 2016 EWB-USA Northeast Regional Conference. We will also tell you what’s coming up, like our 2nd Annual Spring Gala, and what’s currently happening with our International Project. So go ahead, scroll down, and see what the EWB-USA CCNY Team has been up to! 2016 Fall Wine & Cheese Social | Fun for All! Firstly, we would like to thank everyone who attended our first ever Wine & Cheese Social and helped make it a success. Our Wine & Cheese Social was held at Cedar Local with 40 guests in attendance from students to professionals from STV, Greenbuild Construction, Bridges to Community, and Louis Berger. Professionals and students enjoyed the social with food and drinks. Students and professionals were able to network, build relationships with one another and our team was able to provide updates about our current project in Nicaragua. After such a successful event, we look forward to our Spring Gala to further build our relationships and continue progressing with our international and domestic projects. 2016 EWB-USA Northeast Regional Conference| Chapters Unite! On the first weekend of November, 8 members from the chapter travelled to Boston, Massachusetts for the annual conference between Northeast EWB-USA Regional chapters. It was a weekend full of talks and events discussing the future of the organization and chapters learning from each other’s experiences and lessons learned over the past year. During the meeting, our members were able to meet other members from chapters who had similar projects to ours. They were also able to meet with members from professional chapters who had more experience in the field. Our members learned that the difficulties our chapter was going through pertaining the project and the project process was shared by other chapters. We were able to converse and share how we tackled these problems and at the same time received insight on how other chapters did it as well. Overall, our members that made the trip are hoping to integrate a lot of what was learned to the projects that are currently in progress and all future projects. EWB-USA Year-End Fundraiser Competition | Winners! This winter, Engineers Without Borders USA held a competition for the national student chapters. The chapter that either raised the most money and/or received the largest number of donations each week of December would win $1,000 from the organization. We got together and decided our best bet was to concentrate on procuring the highest number of donations for the second week. The first week did not allow us enough time to promote and the second was the last week of class before finals. Any time after that would not allow us to access all of the students regularly coming to the CCNY campus. Using social media, a bakesale, and personal contacts, we successfully received 87 donations, the most in that week, which rewarded us with an extra $1,000 from EWB-USA. After returning from our first assessment trip, the project team was hard at work. We spoke to several of our mentors and concluded that there is still more data and information to be collected from the community. Therefore, the project currently remains in the Assessment phase. Another trip is needed to gather sufficient information that would transition the project into the Design phase. Despite this small setback, the project team compiled a Google Map template of all the GPS coordinates recorded from the trip. The team also analyzed the water quality of each of the beneficiary’s water source to properly determine the type of solution each one needs. Now during this month, our local NGO has agreed to help us collect more community information and GPS coordinates remotely. As our chapter continues to grow, the chapter has been able to take its first steps in adopting another project. Our next domestic project will be located here in our chapter’s home, Harlem, New York. Our team will be focusing on an energy auditing program throughout the community in order to promote green energy and cost efficient buildings. With the help of Antuan Cannon, CEO of the green development company Envirolution One, our members will be able to perform energy audits across Harlem by assessing the light and gas bills and the current fixtures in the buildings. Mr. Cannon has hosted a series of workshops, training our members in the basics of light auditing and bill analysis in order to prepare us for this exciting project. Our current potential partner is the Broadway Presbyterian Church, a destination just a 15 minute train ride away from the CCNY campus. The Broadway Presbyterian Church has various programs such as a nursery school and a soup kitchen that are vital for the community. So as the church begins to spend their money on much needed repairs for their more than 100 year old building, an energy auditing project that can save them thousands of dollars can be exactly what they need. As always, EWB-USA CCNY continues to volunteer through various outlets across New York. 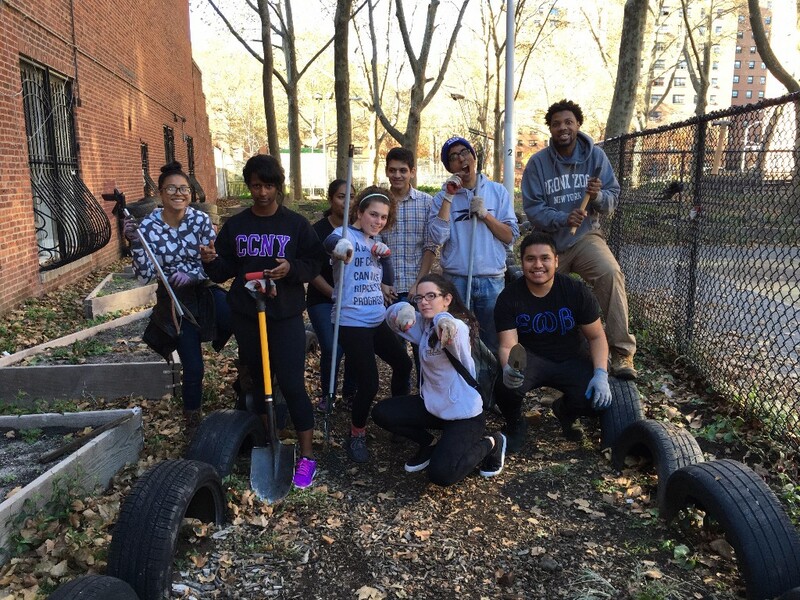 Our EWB chapter volunteered in an event with Concrete Safaris led by Chevon Cooper, and cleaned up a garden in an East Harlem neighborhood that provides fresh produce to the local community. We worked on tasks that were too difficult and demanding for the children to do, which involved moving wood chips, moving and stacking logs of wood, disposing trash, clearing and cleaning the garden, and planting daisies. Following the success of the 2016 Spring Gala, we will be hosting our 2nd annual Spring Gala to continue the conversation with our supporters. Join the EWB CCNY team as we enjoy the night with food and drinks and we continue to progress with our international project and domestic project! Keep a lookout for the official invitation in the upcoming weeks. Thank you sponsors! | You make this possible! We would like give a special thank you to all of the companies and organizations that have made these projects possible! We want to especially thank Louis Berger, Langan, and Envirolution One for mentoring the project teams and STV and EP Engineering for the donations they have provided in the past months. Your continued support has been invaluable to our projects and chapter. Thank you for all your help. If you like what you see, support us! As a group of students, its not easy making these projects happen. Yet, with your support, you can make it possible. Whether its a dollar, or a like, your support means the world to us! Copyright © 2017 Engineers Without Borders-USA City College of New York Student Chapter, All rights reserved.